The nearby galaxy creates a new star every two years. 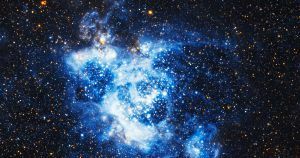 NASA and the European Space Agency (ESA) just released a breathtaking new Hubble image of the Triangulum Galaxy, one of our galaxy’s nearest cosmic neighbors. The full 665-million-pixel image, composed of 54 different photos, shows between 10 and 15 million of the galaxy’s 40 billion stars. Hubble scientists say that the extraordinarily detailed new image could help them learn more about how new stars form. Vast regions of the Triangulum Galaxy are full of gas and dust clouds which hold the raw materials for new stars. Past research by the Hubble team found that a new star the size of our sun is formed in these clouds roughly once every two years — a dizzying frequency on cosmic timescales. The odds of watching a star form are stacked against scientists, but this new survey highlighting hotbeds of celestial activity give NASA and ESA researchers a much better shot at watching and understanding the process than ever before. Stars live for a long time — often billions of years. Many of the stars we can observe are well into their lifespans, so having a readily-available way to watch and study celestial newborns is useful to astronomers and astrophysicists who want to fill the blanks. It’s questions like these that inspired the recent Hubble survey of the Triangulum Galaxy. As scientists go through the data they collected, we may learn a lot more about how stars like our Sun came to be.